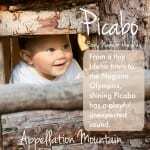 It’s a well-traveled surname name with an on-trend sound. 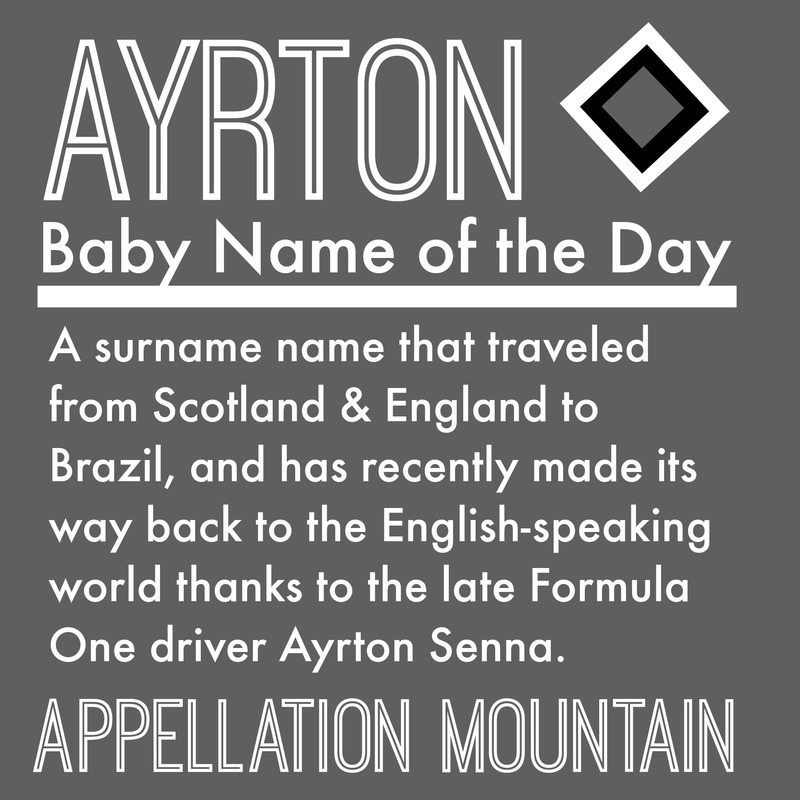 Thanks to Kenneth for suggesting Ayrton as our Baby Name of the Day. Let’s start with the most famous bearer of the name: Ayrton Senna, one of the most successful Formula One drivers of recent decades. Senna was born in Brazil, a bastion of creative and daring baby names. He won three Formula One world championships before dying in an accident during the 1994 San Marino Grand Prix. A 2010 documentary made in his native Brazil recounted his career and tragic death. But where did Senna get his unusual first name? 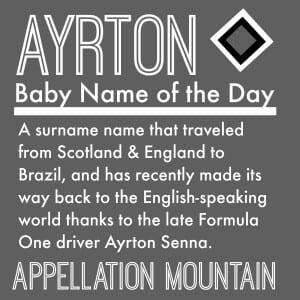 I couldn’t find any mention of Senna specifically, but Ayrton is a surname name. 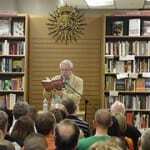 It could be a cousin to Ayer and Ayers, from the word heir, ultimately from the Latin heredum. An heir is one expected to inherit property, a title, or both. And then there’s Ayr, the Scottish place name. Ayr is a town in Ayrshire, Scotland. Other spellings include Are, Aire, Ayre and Eyre – as in Charlotte Bronte’s Jane Eyre. The town takes its name from the River Ayr, and the river’s name is thought to come from either a Gaelic word meaning clear, or possibly Old Norse origins. In English, this name takes a two syllable pronunciation: AIR ton. But Senna said his name more like ah EER ton. Senna also isn’t the first Brazilian to wear the name. Footballer Ayrton Andrioli was born in 1965, well before Senna. Malta-born footballer Ayrton Azzopardi was born in 1983. Another Brazilian bearer of the name was also a footballer: Ayrton Ganino, born in 1985. Lastly, Italian race car driver Ayrton Bandovini, was born in 1986. And then there’s Gary dos Santos. Until recently, dos Santos was known as the Mayor of Strawberry Fields, the man who served as the unofficial greeter at the John Lennon “Imagine” memorial in Central Park. Gary dos Santos was born in the 1960s as Ayrton dos Santos, Jr. I also found a Brazilian Airton, born in 1942. I’m missing exactly how this English-Scottish surname name made its way to South America. But travel it did, and perhaps Brazil is ready to send the name back to the English-speaking world today. Jules Verne’s In Search of the Castaways, published in 1873, included a character called Tom Ayrton. He’s the villain of the piece. Tom also appears in Verne’s 1874 novel The Mysterious Island. In 1962, Disney adapted Castaways as a musical starring Haley Mills. It was successful, raising the question – did some parents discover Ayrton through the books or their adaptations? It doesn’t look like Jules Verne or Disney gets credit for the name’s use in the US. The first few Ayrtons arrived in the mid-1980s, just as Senna’s career was taking off. 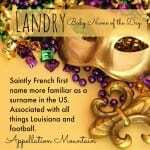 23 boys were given the name in 2011. 46 newborn Ayrtons arrived in 2012. 33 were born in 2013. None of the other possible spellings has caught on. Colton and Easton are in the US Top 100, and still rising. The Top 250 includes Braxton, Paxton, Weston, and Kingston. Farther out in the US Top 1000, Remington, Jaxton, Daxton, and Princeton are all on the rise, too. All of this makes Ayrton a real possibility for parents after something different for a son in 2015. Ayrton Andrioli being born in 1965 would make him 5 years younger than Senna. Edit that mistake please.